If you’re planning on attending Mickey’s Very Merry Christmas Party this holiday season, make sure you don’t miss these 5 super-fun festive activities! I received tickets to Mickey’s Very Merry Christmas Party in exchange for my honest opinion of the event. As always, my unbiased opinions are 100% my own and you can trust what I say to be true. We’re huge fans of celebrating Christmas at Disney World! Disney does it right, they go all out! Every hotel on Disney property is decorated meticulously and all four of the parks are packed with Christmas cheer. Every single detail is on point. If you’re not in a Christmas-y mood before you go to Disney World, you definitely will be in one when you leave. Check this list out to see our favorite free Christmas activities to do at Disney World! If you’re a Christmas obsessed Disney lover like I am than the ultimate event that will make your holiday season spectacularly festive is Mickey’s Very Merry Christmas Party at the Magic Kingdom! My husband and I have attended this event once before about five years ago. This years event did not disappoint! In fact, I noticed that there were more decorations, more surprises, and even more fun things to do! I’m a huge pug lover and I would LOVE to get any one of these special pug-themed gifts for Christmas! I think being a pug lover is in my blood. My grandma had a girl pug named Suzie. Even though Suzie passed before I was born, I’ve always felt a connection to them. I just feel drawn to them! Now that Travis and I have our own home, I’ve been dropping hints to him like crazy that I think it’s time for us to add a dog to our family. At first, he said, “no, absolutely not.” He’s softened up a little bit after watching the millions of cute pug videos and the daily pics of Doug the Pug that I’ve shown to him. BTW if you’re not following Doug the Pug by now and you love pugs like I do, where have you been, hiding under a rock? Doug is everywhere! He will make you smile and giggle even when you’re having the worst day ever. Travis says we can start looking after we get married in February, so that’s what I’m counting on. I just know my little “Pudge” or “Willis” the pug is out there waiting for me to scoop him/her up and love them forever! I was shopping last week at HomeGoods with my mom and I found the most adorable Christmas pug coffee cup or as I like to call it, my Christmas puggy muggy! I excitedly searched the store for other pug-themed things but didn’t find anything else. Don’t get me wrong, I was very happy to find the Christmas puggy muggy but it made me think that there must be other people out there who would appreciate pug-themed items just as much as I do! Right? 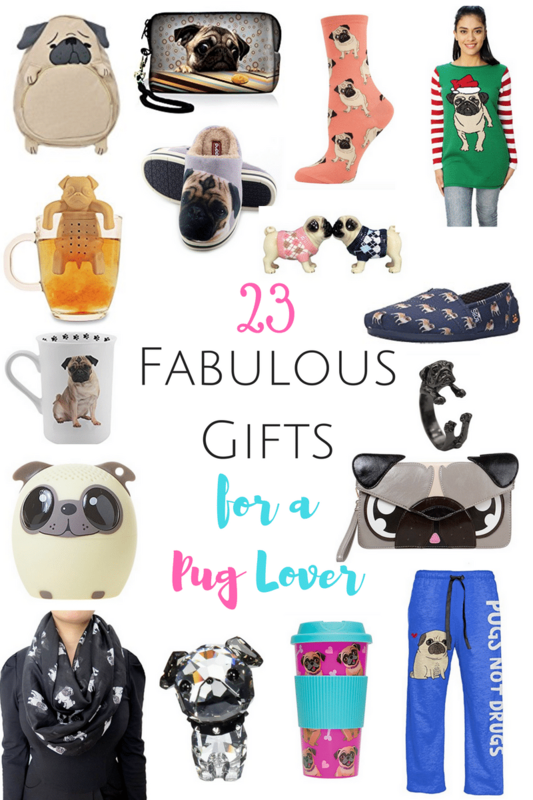 So, I’ve compiled a list of pug-themed gifts that any pug lover would adore! Our favorite classic margaritas recipe with a spicy ginger kick for Christmas! Plus an easy way to garnish your drink to make it extra festive! Vegan. Only two more sleeps until Christmas! How can that be?? I just want to rewind the clock about two weeks, so I can enjoy the season a little bit longer. Don’t you? I have a last-minute holiday drink recipe for you that will spice up your life! We’re furiously trying to get everything done over here but we did make time to relax and watch a few of our favorite Christmas movies. Travis always insists that we wait until the last week before Christmas to watch certain movies like Home Alone or The Santa Claus. Christmas Vacation is another one of our favorites that we watch while we’re decorating the Christmas tree and then again right before Christmas.